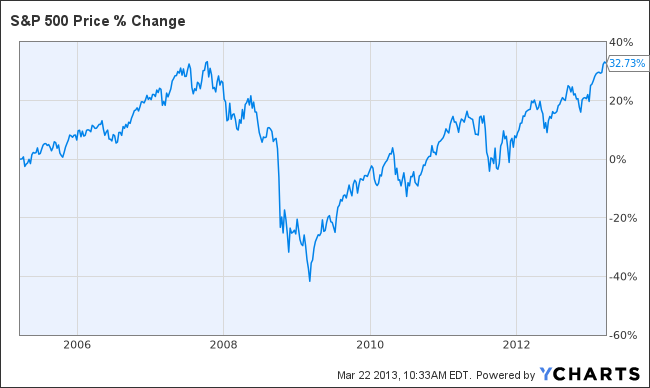 The following is a high level discussion of the recent history of the S&P 500 stock index. advice for any particular investor, but is intended for general education purposes only. Investors should consult with a qualified financial professional. All other DRWFinancial.com disclaimers apply. 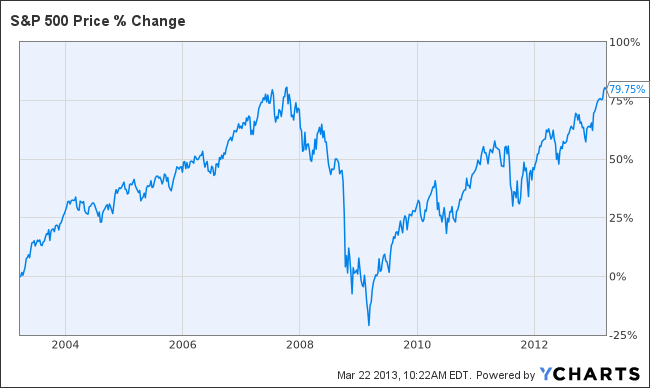 The last time the S&P 500 traded at the current levels (in the mid 1500 price range) was Fall of 2007. On October 5 of that year, for example, the index closed at 1558. Today, as of ~ 10am, the index is right at 1550. In many ways, this comparison can feel depressing: what do we have to show for the last 5.5 years!? As you can see, from that starting point in 2003 the market rose more 70%, then fell considerably, and has since risen again overall ~ 79.75%. Someone invested in a fund that tracks the index (like the SPY exchange traded S&P 500 fund) over those 10 years would have experienced similar growth. As it turns out, including dividends in the 10 year math makes a big difference. The total return vs just the return on price moves the number from 79.75% up to 120% - that seems to be a material difference!